Billed yearly until canceled. Support and updates are included. Do you want to do more amazing stuff with your website? 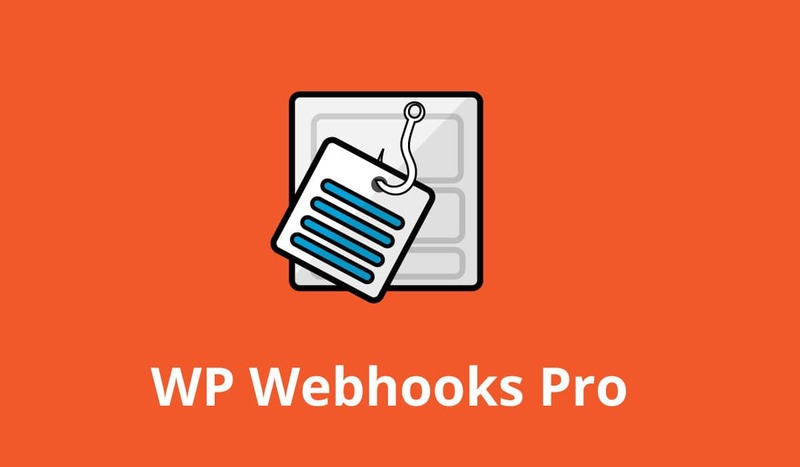 WP Webhooks Pro turns your website into a highly optimized webhook system. 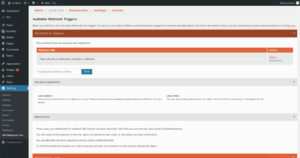 You can set up various actions and triggers like for example adding, updating and deleting a user. 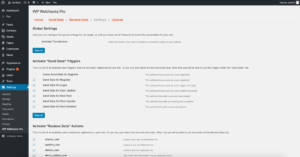 It is also possible to create various webhook URL's for every action and trigger so that you can set up multiple URL's within one webhook. It is also possible to create Blog Posts via Email by using our free extension Create Blog Post Via Email for WP Webhooks Pro. For a list of all features, please check out our feature list down below. 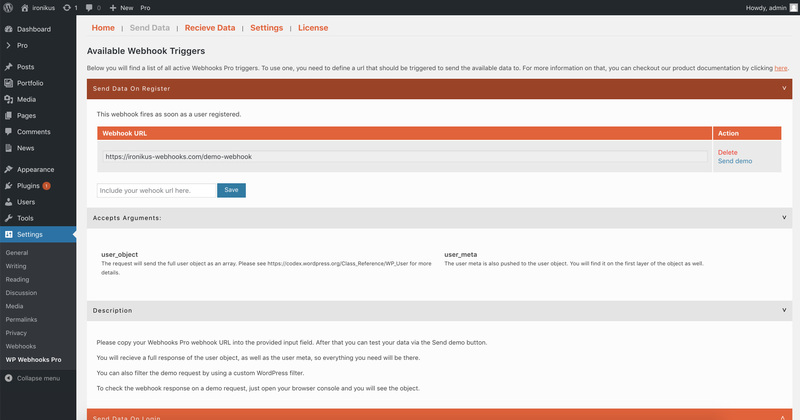 We offer great (and completely free) extensions for our plugin to make your WordPress even more flexible! Click here to find out more about our extensions. You are now able to test our plugin using our free version. Click here for more details. Extend your website with the most powerful webhook system. 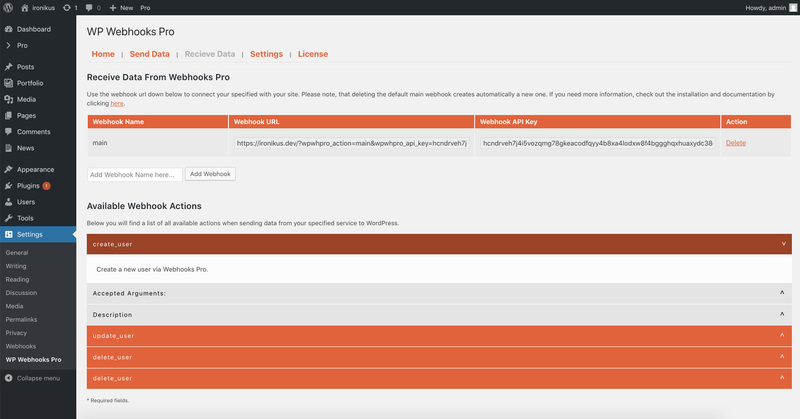 Go to Settings > WP Webhooks Pro and include your license. Activate your license and you are ready to automate! Feature: Add our new Assistant Bot to our plugin. It will help you to solve tons of things directly from your dashboard. 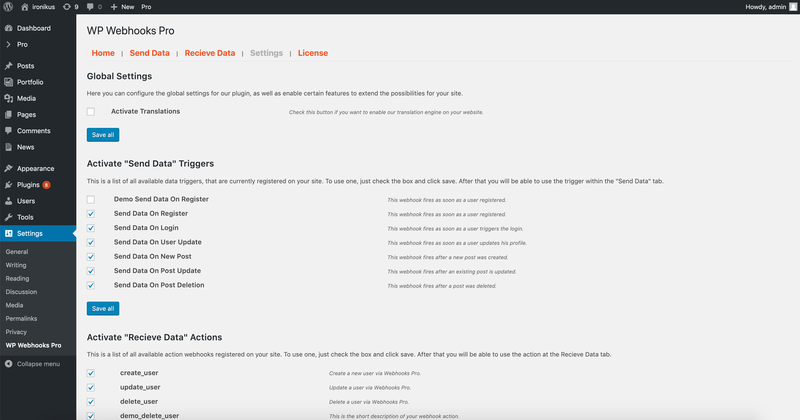 Feature: New action webhook to test fucntionality. Feature: New response field inside of actions to see what data you can expect to come back. Feature: New sent data field inside of triggers to see which data gets send after a trigger fires. Feature: Allow JSON for custom user meta and post meta for a better handling of complex values. Feature: Global handler for action response json (Now we validate the response as a json with multiple data fields. 2019 Ironikus FZE. all rights reserved.